Event Schema Markup is code that you put on your website to help the search engines return more informative results for users. By adding event schema markup, search engines (Google, Bing, Yandex, and Yahoo!) 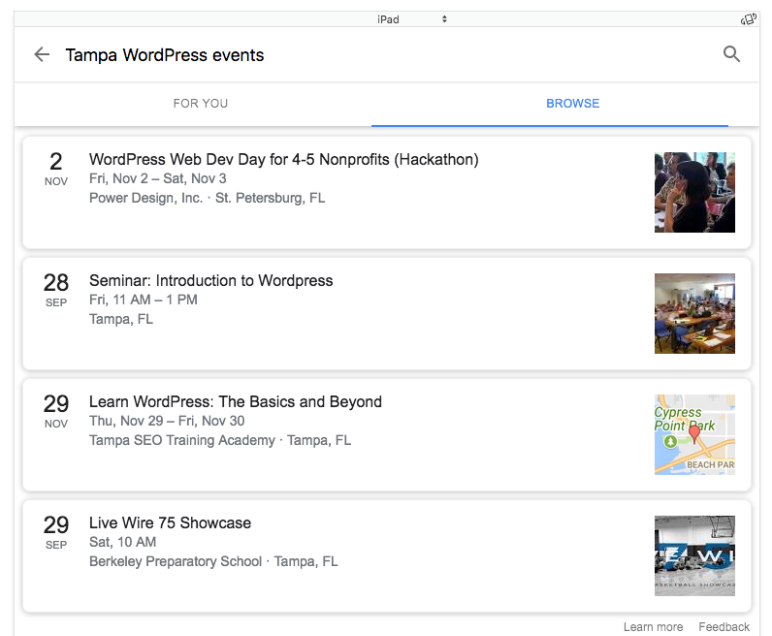 can read important details about the event, then generate what is known as a “rich snippet” in the organic search engine results pages. 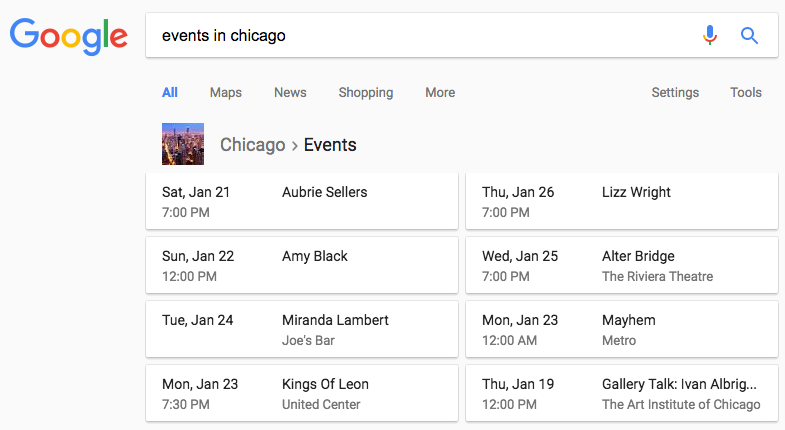 For example, here is an search specific to “events in chicago”. The result are specific to the events happening now in Chicago, and the format is special for events. The event schema markup includes details such as when an event is happening, venue, time and location. Without this type of structured data, a web page is essentially all information with no context; adding structured data gives it that context. How do I enable the Schema Markup feature? Schema markup takes the form of code that you can add to your web page to define what the different elements – like dates, images, opening hours or reviews – all mean. Typically, you would add the schema markup code to your pages. However, nothing more is needed to implement the event schema feature in Event Espresso 4. The event schema feature became available in EE4 Core on January 17, 2017, when we released Event Espresso 4.9.26 and will be automatically generated for each event page. Since there are no code changes needed on your part, please be sure to include featured images and venue information with your event details. Event schema markup data for the event dates, name, prices, and URL is automatically added to each event post. Want to Get Familiar with Schema Markup? How to Boost Your SEO by Using Schema Markup — One of the latest evolution’s in SEO is called schema markup. This new form of optimization is one of the most powerful, but least-utilized forms of SEO available today. Once you grasp the concept and method of schema markup, you can boost your website in the search engine result pages (SERPs). How to Use Schema Markup for SEO: Making Your Site Easier to Find for Stupid Machines — Including schema microdata in your web pages is a lot like eating well, exercising or getting a good night’s rest – you know you should be doing it, but actually following through can be harder than it sounds. Unless you’re a health nut, in which case please stop telling us about Crossfit. Learn about Schema Structured Data — Schema.org (often called Schema) is a specific vocabulary of tags (or microdata) that you can add to your HTML to improve the way your page is represented in SERPs. Search Engine Marketing for Events — Running search engine optimization campaigns is an effective marketing strategy for promoting events. 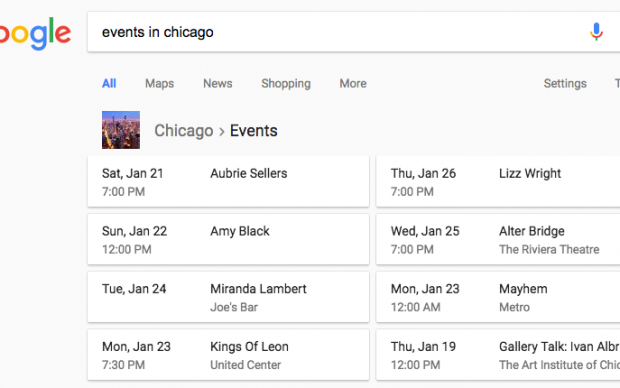 Using Event Schema Markup to provide Google and other search engines important data about your event, you can get the most out of your event’s search engine marketing campaign. List events without the requirement for attendees to select tickets. Use Event Espresso for any type of event, not only when tickets are for sale. Generate a list of attendees who have registered or purchased tickets and check-in online those who attend for record keeping.